Ralphie! Don't take off the pink nightmare your Aunt Clara made for you...because if you do, the Jólakötturinn will eat you! We love that movie. We watch it every Thanksgiving after dinner. 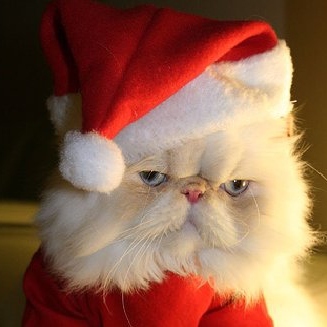 I do love that little kitty in the Santa hat too! We love that movie too. Oh the humiliation for poor Ralphie in that pink suit.